Master Davey's precious Blue Tiger Tea is about to disappear from the world forever. 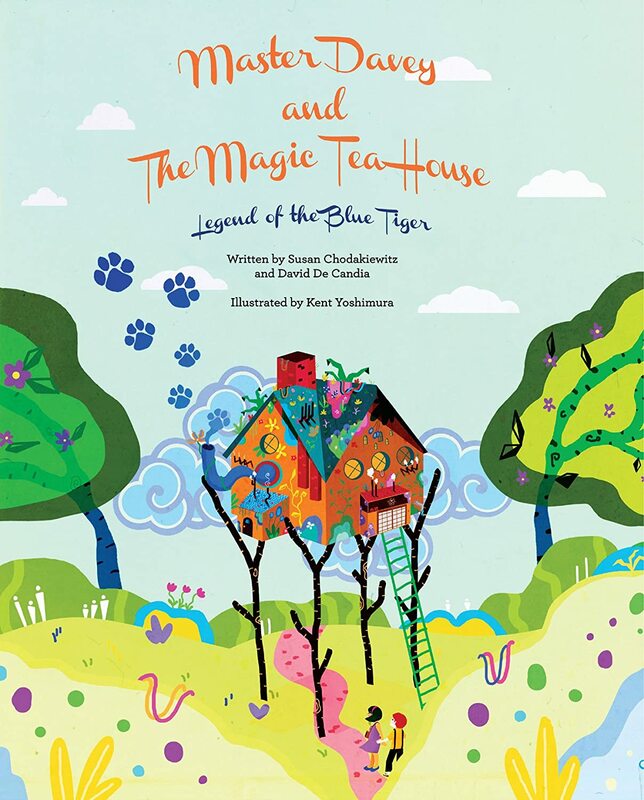 Can Hopper Smith, a boy with the power to unlock the stories hidden inside each tea, find the courage to face the fierce Blue Tiger and save the tea? A unique adventure story. Also in hard cover and gift set with Blue Tiger Herbal Infusion. Children and families can enjoy reading the book and sharing tea. What stories will YOU unlock from the tea? Susan Chodakiewitz is the author of Too Many Visitors for One Little House, Wobegon and Mildred, and Mr. Snoozle's Exquisite Eggs. A composer, lyricist and producer, Susan has appeared in schools, libraries, and museums worldwide for author events. She recently travelled with co-author tea master David De Candia to Sri Lanka where they read and gave away books to children at the Tea Estates and at a Cancer Hospital in Sri Lanka. David De Candia is tea master and Director of Tea at the Coffee Bean & Tea Leaf. His travels to tea estates around the world to taste and select teas for the Coffee Bean & Tea Leaf. The stories and adventures he experienced as part of this travel was a big contribution to the inspiration for Master Davey and the Magic Tea House. This story is centered around a boy named Hopper who often visited the tea house of Master Davey. Hopper learned about tea as he drank it in Master Davey's Magic Tea House. Hopper becomes involved in the challenge to help save a village that used to grow the rare and special Blue Tiger Tea. He is transformed magically to China and begins his quest to help a young girl named Camillia find the seeds of the Blue Tiger Tea. Their adventure takes them through many challenges but they succeed. The story shows the perseverance of Hopper and that his kindness to others brings him reward from the emperor. The story is a nice one about a boy's adventure and his determination to find the lost tea seeds.